The blog format can be ideal for spreading messages, issuing statements and expressing opinions for issues that benefit from reader interaction. Blogging is perfect for getting political statements out or spreading human rights awareness. Religious groups find the blog format great for generating interest, encouraging interaction and even sharing on social sites. Blogging can fill a void that social sites leave when you want to share more detail with things like weight loss or upcoming events. Virtually any interest you can fathom can be found on blogs. Blogs are an easy solution for an online journal or diary. Sharing thoughts, ideas and travels are a breeze with your own blog. Documenting difficult or satisfying experiences, whether for you or to share with others, can be managed with ease on a blog. There is thousands of blogs setup entirely for profit. There are AdSense blogs, niche blogs, blogs designed to sell a single product or product bundles. There are list building blogs, affiliate blogs and more. Blogs can be setup fast, automated and set loose as an income generator. We see these online profit blogs everywhere and I believe it’s just the beginning. Blogging can help you build a fantastic reputation and even be recognized as an expert in almost any field. We see bloggers on news interviews and hear radio shows speaking with bloggers to get expert opinions on the subject at hand. 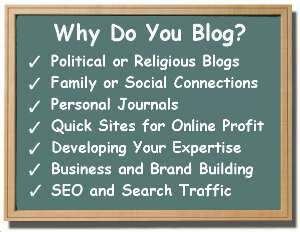 Bloggers gain popularity, employment and even new clientele by blogging as an expert. Thousands of businesses of every size have discovered the benefits of building brands by blogging. Whether the brand is your personal name, your corporate identity or the next big product launch blogging can handle it. Every business understands the importance of customer support, interaction and development. Blogging is a relatively easy tool for meeting those needs. Blogs encourage customer engagement and can aide in building data and an email list. Displaying FAQs and product testimonials are simple matters with blogging tools. Contact and HelpDesk plugins help with customer support. Search engines love blogs and using the blog format can help bring in search engine traffic. Blogging makes it easy to build back links by participating on other relevant blogs, submitting to blog directories and blog post rating sites. A multitude of themes, plugins and tutorials help even the most novice blogger with search engine optimization. Many website have moved to blogs simply for the ease of updating and maintaining content and structure. Free and premium blog themes can make the simplest blogs look like professionally designed websites. The learning curve is minimal with blog formats and very little HTML or script understanding is required. Another advantage that blogs have over static sites is the ability to regularly backup content and databases. I’m sure I’ve missed other reasons to blog but you get the idea. The first step is to understand exactly why you are blogging. Once you have that figured that out it’s simply a matter of putting together an outline that will help that happen. I will be coving that aspect of blogging very soon in order to help you develop clear guidelines and goals. I apologize but the poll plugin was playing havoc with Firefox users so I had to remove it. Are you running multiple blogs with different agendas? I’d love to hear your input below.